Judge under Law Department of Odisha Judicial Service. Candidates who have suitable qualification can apply for the Civil Judge Post in Odisha through Online mode from 26/09/2018 to 25/10/2018. This is the great opportunity from OPSC. Candidates who desire to be in an honorable Judge position start to prepare for the exam. More details like Vacancy & its Reservations, Age Limit, Qualifications, Application fee & Procedure, Selection Process etc., are described below. 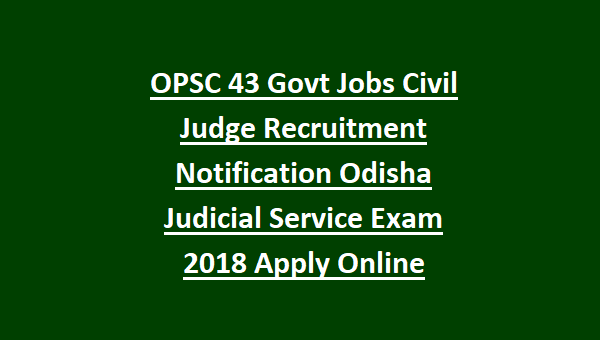 For more information regarding Judicial Service Exam for Civil Judge recruitment in Odisha see the below given details. 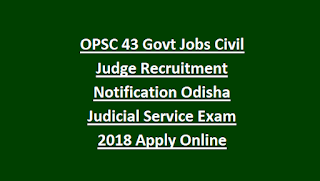 The Pay Scale for OPSC Recruitment in Odisha Judicial Service under Law Department is 27,700-700-33,090-920-40,450-1080-44,770/- with DA and other allowances as approved by the Odisha Government. The Candidate applying for the post in Law Department should satisfy the age between 23 and 35 years and he should be born between the years of 02/08/1983 and 01/08/1995. For further Age Relaxation Details please refer the official notification given in GovtJobOnline. 1. Candidates should acquire Graduation Degree in Law of a University/ Institution recognized by the Indian Government. 2. A Superintendent/Ministerial Officer in High Court/Civil or Criminal Court Subordinate to High Court can able to apply for this post. 3. This Post is also applicable to Assistant Law Officer or Translator of the Law Department of Government. 1. The Candidate applying for the post can pay Rs. 300/- as application fee in SBI through online Pay-in- Slip Print Out. 2. No application fee for SC/ST and OH (Disability not less than 40%) Candidates. Prelims Exam Pattern: Preliminary Exam will be conducted for 100 Marks. Exam Duration is 90 Minutes and questions will be objective type only. Mains Exam Pattern: Mains Exam will consist two Compulsory papers and three optional papers. Each of the Compulsory Paper exam duration is 150 Minutes and for Optional papers, exam duration is 180 minutes. Each paper will be conducted for 150 Marks. Total marks for Mains Examination is 750 Marks. 6. At last Take a copy of online application form for future purpose.